I was so surprised to learn about Christian Writers. Since I was Christian who read and wrote, how had I missed this? Following other Christian writers and their works inspired more questions. What makes a Christian novel? How does a Romance novel become a Christian Romance novel? Westerns and fantasy can be Christian? I researched the web and think I began to understand they aren’t intended to “teach” Scripture or dogma. They are carefully designed to show the faith—lack of-- in the character, and show how that affects what happens—or doesn’t—in the story. I put the cart before the horse. I had already written my Avery and Gunner stories, a middle grade series based on 14 year-old Avery, in Virginia, 1861-1865. Avery was homeschooled by two well-educated Boston Quakers who moved to western Virginia to farm. Faith in God, moral values, and good ethics, are already a part of who Avery is before age 14 when he began his journey across his state. His ability to deal with adversity, forgive others, understand death, and be charitable come from his faith. It’s who he is. What do you know? I wrote a Christian novel. Since you’re reading this blog that probably doesn’t surprise you. What is surprising is that it took five years for me to realize this. During that time Avery visited the Children’s Bologna Book Fair two years, and was peddled to major publishers, one of whom wanted film rights, and the other wanted to bid. Then they both pulled out, and the agents, who loved Avery and Gunner, decided they’d done all they could. Here’s the rub. I had done whatever the editors asked. I learned a lot from them, and did it all quickly and completely. I appreciate that experience. But in the end, they said Avery wasn’t believeable. Today’s kids wouldn’t “get” his faith. He needed to be “bad.” Their suggestion was that the other character, Claire, should be introduced at an earlier age and should provide “sexual tension.” They could do “things.” They made some specific suggestions. They said that’s what it takes to sell books, this is the “edginess” today’s young people want. Really? I guess we won’t sell it then. I can do what they ask for editing and revision, but I can’t compromise Avery. I know him. The first editor of the first Christian publisher who saw it, embraced it. They have faith there is a need for these kinds of books. Avery is an admirable model, though he never quotes scripture, but he remembers what his father told him. He’s comfortable in his meeting house in the Kanawha Valley, but he’s just as comfortable in George Washington’s church in Alexandria, and is mesmerized by the stained glass in St. Mary’s historical church. Praying beside Claire is a comfort. Avery’s faith shines through the pages of Avery’s Battlefield. He has a Christian world vision, which is what I now understand, is what Christian literature is all about. And how did it happen that the Christian publisher saw it? After deciding Avery and Gunner would live in the desk drawer forever, I had a sit down with God. “Look, I said, 'If writing isn’t what you want me to do, that’s okay, I’ll do what you want, but you need to let me know. I thought you were with me and Avery for these five years of writing. Tell me what to do now.” I was closing down the computer when I happen to see a peculiar logo on the screen, someone had sent to me. I’d never seen it before, very colorful. I hit print and shut it down. In the morning it was lying on the printer. An invitation to a Christian Writers’ Conference. “Okay,” I said to God. “Did you know about this?” I stepped out on faith into the unknown, just as Avery and Gunner in my story, uncompromised. Faith may be tested, but it doesn’t have to be compromised. Deanna Klingel lives in Sapphire, NC, in the Blue Ridge Mountains, where she and her husband are active in the community and their parish. Deanna is a therapy dog handler and visits weekly to nursing homes, hospitals, and other facilities with her therapy dog. She's the author of Just for the Moment: The Remarkable Gift of the Therapy Dog, and two ebooks, Rebecca & Heart, and Beth's Backyard Friends, both on Storyrealm.com. Deanna's short stories, Marsha Blue (1st place, DreamQuest), The Mayor of Ingles' Parking Lot (2nd place, Scinti), and The Old Bicycle ( Milestones Literary Journal) can all be read on her website, www.BooksByDeanna.com. Deanna and husband Dave have 7 grown children, and 11 grandchildren. The story of a boy, his dog, and their search for peace in the first years of the Civil War. Avery and his dog Gunner have a good life in Kanawha Valley. But when the long unrest between the North and the South ignites into war, Avery and Gunner begin a dangerous journey that will take them across the paths of people on both sides of the struggle. Avery discovers that his battlefield is in the clinics and hospitals, where the anger and pain continue long after the fighting ends. 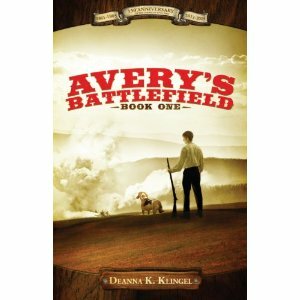 AVERY'S BATTLEFIELD can be purchased at BJU Press and Amazon. I think the term Christian writer is a very broad term and is interpreted by each person differently. I remember in grad school we spent hours debating this term and until now I don't think it was settled. The measure that I personally use is to look at the (product or talent) from the eyes of God to see if it is pleasing to Him. I read your words and it is easy to see that you have spent 5 years writing this book. The same for many other writers such as my much better half. Honestly I don't personally have the perseverance to do what you have done and it is very obvious that it must be a powerful internal passion driving you. Thank you for sharing your book and story with us. I agree, faith doesn't have to be compromised just to make a sale. I have two historical romances that I could have sold many years ago, -IF- I did the one thing I refused to do: "spice" them up. I wasn't willing to compromise my values. And so those two books sit in a box in my garage, and now I write Christian fiction. If I never sell a book, at least I can say I did not compromise my values. I'm glad you didn't either, Deanna. Thanks for joining us today. Thanks for sharing with us today, Deanna! I am always encouraged to read about authors' journeys. Sometimes, a writer sells right out of the chute, but most of us have to persevere and discern God's will. I worked on a novel for 2 years that may never be published, but God taught me a lot through the experience, and I trust in His timing for when/if I sign a contract. Your book sounds fun; I'm always looking for Christian fiction for my kids (and for me!). Thanks! Thanks for coming by and sharing your experiences. It always encourages me when I hear stories of Christians sticking to their guns and not compromising in areas they consider important! Hi Deanna, I'm in the Blue Ridge Mountains right now! I'm curious which Writer's Conference you attended. I'll be back here next month for the Blue Ridge Christian Writers Conference. Deanna, thanks for stopping by the Inkwell. I'm so glad you found a home for your story with no compromise and no regrets! I'm glad you found the right people to help you publish the book you wanted to write. Sounds like a great book. I think I might be able to get my brother to read it. Thanks Deanna for sharing your story!